When the Radisson Hotel was built at 505 W. Superior St. in 1970, it was Duluth’s first new hotel in 43 years. It would be difficult to count the number that were built in the next 43 years, but not impossible. Go ahead and try. The Radisson replaced the Holland Hotel, which operated from 1910 to 1961. It has underwent several renovations. The parking ramp was added in roughly 1977, along with an expansion adding 60 new rooms. Mechanical systems were replaced in 2013; all 268 rooms and various common spaces were updated in 2015-’16. New Radisson Hotel coming to Duluth Gateway! I can't keep track of those built in the past five years. I might be missing something obvious, but it's occurring to me that with the demolition of so many of Duluth's grand old hotels, and the conversion of many of the smaller old hotels into apartment buildings, the Radisson might now be Duluth's oldest hotel still in operation. If that's true, then a list of the hotels built after the Radisson would basically just be a list of every hotel in Duluth. Also, the distinction of hotel vs. motel must be made, because I think numerous motels were built in the 1950s and '60s. Willard Munger Inn has been in continuous operation since 1954, which seems to make it the oldest still-in-operation lodging in Duluth. If you count it in the motel category, which seems reasonable, that would confirm that the no-hotels-for-43-years claim didn't include motels. This link from a few years ago on PDD indicates the Radisson was the first downtown hotel built in 43 years ... and also mentions the loss of hotel rooms from the urban renewal projects. Although from what I've read, many of those hotels had also gone residential in that time, which was one of the motivators to get rid of them. I think there are still ramifications for Duluth's homeless population today. The article linked to by Gina refers to the Radisson as a “high-rise motor hotel,” which turns out to be a very particular concept that ties together a lot of the ideas in this post. 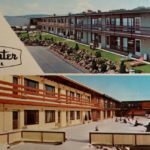 An architectural history of the Deville Motor Hotel describes how the motor hotel concept came to St. Louis and the general outline seems to fit the history of the Radisson pretty well. If you look at a photo of the Holland Hotel in the same location, you can see how its main entrance faces the street and it is surrounded by other city buildings rather than parking lots. The Radisson’s main entrance is at the back of the building, in a mid-block drive through that connects to a multi-level parking structure. If you accept the motor hotel as its own category, an auto-oriented motel in an urban setting, does downtown Duluth have any hotels left at all? I think Fitger’s Inn would qualify. And the Sheraton and the Suites, even with rear entrances connected to large parking areas, still mimic the form of traditional urban hotels. Regardless of how we define a hotel, the Radisson definitely marked a change for Duluth in how urban hotels were designed (and as Gina noted, who they served), and not having any hotels in operation from before that period probably makes what might otherwise be a rather clear distinction rather difficult to see. MATTHIJS, thanks for that. My theory (backed up by some historical writing about Duluth that I've found) is that grand old hotels built near train stations quickly became passe as people became more mobile. If you were walking to the hotel from the train station, as many people were in the early days, close was good. But if you had more choice, it was more desirable to get farther away from the noise and smoke of the Depots. Trains were dirty and loud! So then, the area around the Depots fell into "disrepair" and housed people in need of simple, cheap housing and were deemed the bowery districts. There is a writing project in this somehow, when I get a chance. Get in touch at gina dot temple at gee mail dot com if interested in collaborating.